While not necessarily traditional, this vegetarian ramen is still a dynamite meal for Meatless Monday. This versatile Japanese noodle soup is made with a plethora of vegetables and is exploding with flavor. The stock is seasoned with soy sauce, garlic, ginger and sesame oil. If you have white miso paste on hand, you could easily substitute the soy sauce for the paste as both ingredients add a salty element. The vegetables featured in the recipe are merely suggestions. This is a "kitchen sink" kind of meal so feel free to use up whatever is available in your fridge. You and your family will love slurping down this vegetarian ramen. In a large pot or Dutch oven, heat 1 tablespoon sesame oil over medium high heat. Add garlic and ginger, and cook, stirring frequently so that the aromatics don't burn, until fragrant, about 1 to 2 minutes. Pour in the vegetable stock, mushrooms, broccoli, soy sauce and 2 cups water. Bring the soup to a boil and then reduce the heat and simmer until mushrooms have softened and broccoli is tender, about 10 minutes. Stir in Yaki-Soba until loosened and cooked through, about 2 to 3 minutes. Stir in spinach, grated carrot, peas, water chestnuts and chives and continue to cook until the spinach begins to wilt, about 2 minutes. 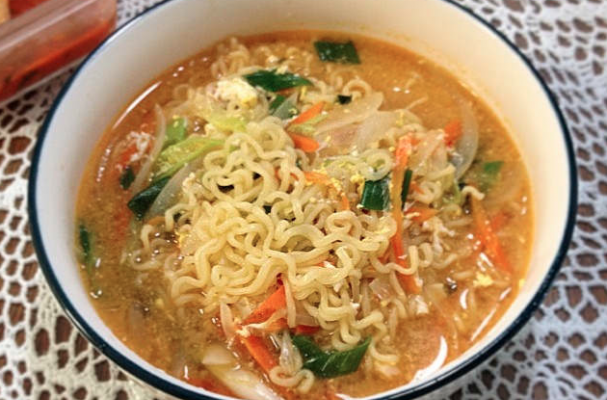 Cut hard boiled eggs in half and serve with the ramen. *Dashi is a traditional Japanese stock that's made from a combination of bonito flakes (dried and smoked skipjack tuna), kombu (kelp), and dried anchovies or sardines. Vegetarian dashi is usually a mixture of kombu and water but you can add dried mushrooms for a enrich the flavor of the stock. If you visit an Asian market, they also have dashi packets that are great for everyday use.